The Shadow Sun Syndicate’s biomorphic and cybernetic nanotechnology is nowhere better represented than with Zor-Maxim, one of the leaders of the zors. These highly skilled and augmented humans wear high-tech armored suits capable of morphing their wearers almost instantly into gigantic fighters employing a destructive combination of martial arts and energy weapons. 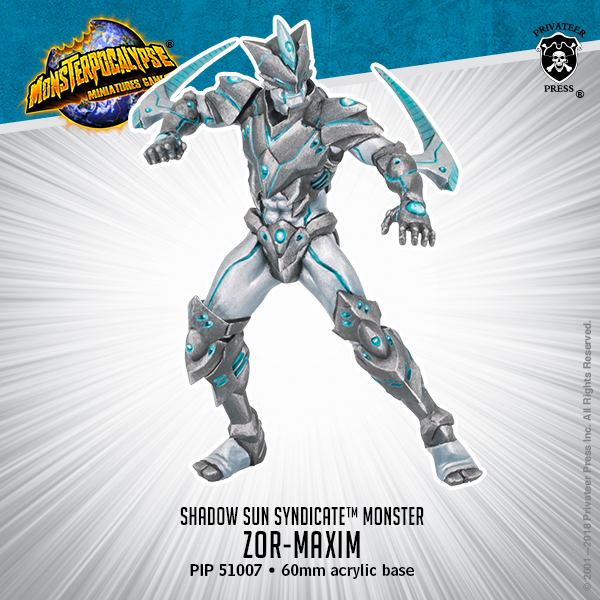 Despite his augmented size, Zor-Maxim displays acrobatic finesse as he evades his enemies and closes in for the kill, then teleports away in a flash of light to pursue the next enigmatic goal of the Syndicate.